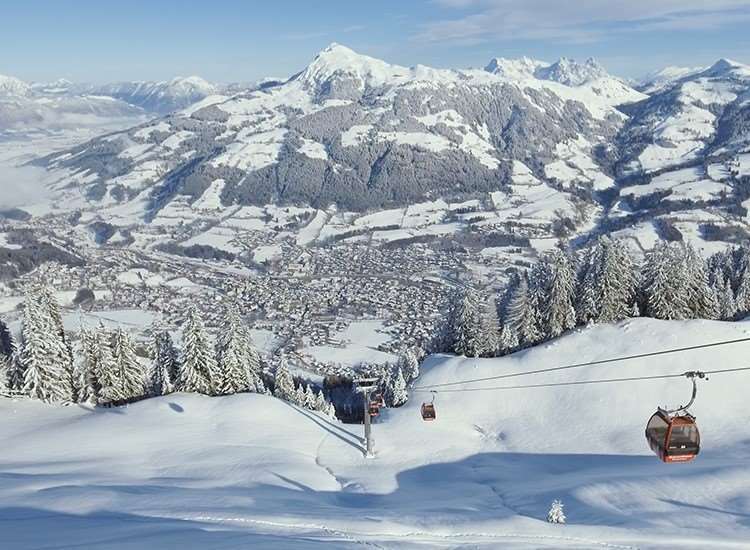 The Jägerwirt is one of Kitzbühel's premier hotels, with the resort centre just a few minutes' walk away. The slopes are also close enough to walk to and the ski bus stops close to the hotel. The hotel is beautifully furnished in traditional style and the restaurant is very highly regarded. The Jägerwirt is family-run and offers a personal touch to make every guest's stay special, which is why many of their guests return year after year. Small Austrian twin rooms have private facilities, cable TV, hairdryer, bathrobes and slippers, safe and balcony. Larger twin rooms which can take a third bed, some with a balcony are available at a supplement. Breakfast is a hot and cold buffet with a Sunday champagne breakfast. Dinner is four courses with a choice of main and daily salad buffet. Weekly Gala dinner and Farmers' buffet. Our first time away from home at Christmas was spent at this FAB hotel. Service and food was second to none and the staff were very friendly, even handing out xmas prezzies on Christmas eve. Our room at the back was traditional and the only fault we had was there was no English speaking channel on the TV as the skiiing days were short. The spa and pool area was amazing and very relaxing but make sure your not shy as it is traditional Austrian style. The lounge area was very comfortable and the evening entertainment although not outstanding, still entertained us. The hotel is not the cheapest and the wine list is expensive so be prepared. This was our second time in Kitz and we will certainly go back there and definatley stay at the Jagerwirt. The hotel is reasonably old and so has zero noise insulation between the rooms - you can hear everything! The hotel also charged 1.95Euros for a cup of hot water for guests (not us but people we met) to take a Lemsip. No tea and coffee making facilities in the room (2.40Euros + 5.00Euros room service charge if you want a cup of tea during the day before the bar opens at 16:00). Food allergy to cheese largely ignored by the restaurant, even when repeatedly asked, and no alternatives offered. Menus not as described in the brochure - there are two fixed menus, meat and vegetarian - often providing the same choice across the two menus. Lack of proper shower in single rooms (our son&#39;s and other guests were the same). Can&#39;t recommend at all I&#39;m afraid.